Are you an alliance manager or interested in becoming one? The Alliance Mastermind is a Group Coaching program for Alliance Managers. For you to grow your results, whether it is in your business or personal life, continuous improvement is essential. As an Alliance Manager, you know that your results come at several levels: amongst others, the development of your alliance and the improvement of your skills. The new Alliance Mastermind is here to help you in your conscious, continuous improvement. With this mastermind group coaching program, I am bringing you a program that will allow you to learn everywhere about alliances and easily improve your alliance skills. What are alliances, and why is it important to create clarity about it? Partner selection or partner assessment? A recording of each call is also included, so if you can’t make it to a live call, you can still watch it. As an independent Executive Coach and Alliance Professional, I have been working with clients from all over the world to help them improve their alliance skills and alliance results. In my coaching, I work mostly one-on-one or with teams. Both models are to learn and improve in alliance results, however they are not within reach for everybody. The new Alliance Mastermind blends those models and is available to everyone. The investment for this program is EUR 444,= per year (excl. VAT). After joining, you will be invited to join a special Facebook group and website with information, tips, tools, and templates for you to improve your alliance skills and alliance results. Additionally, you will also find the free replay videos of the previous group coaching calls in this group. One of the other threads in this Facebook group will be for you to indicate what topics are most essential to you to achieve your results. As an Executive Coach, specializing in Strategic Alliances, I work with business and alliance leaders from international organizations to help them consistently improve their success with strategic alliances. My previous engagements include the restructuring of failing partnerships, setting up new partnerships, facilitating Alliance Masterclasses, and coaching business and alliance leaders. Throughout my working life, I have been working in partnerships, alliances and new business developments with multinational clients and partners. My experience ranges from working in business partner channels to leading the global alliance between IBM and Royal Philips. During the last 9 years, as an independent Executive Coach and Alliance Professional, my clients generally have been internationally oriented organizations. These include organizations such as DSM, Reckitt Benckiser, MedinCell, Royal Philips, Micro Focus, World Waternet, Siemens Building Technologies, ABN AMRO, DSM-Niaga, and Maastricht University. I am a Certified Strategic Alliance Professional (CSAP) and a Certified Coach in the Marshall Goldsmith Stakeholder Centered Coaching methodology. I am the father of 4 fantastic young adults and also an avid hiker, especially on the Camino to Santiago de Compostela. During the last 5 years I have walked 5 different Camino’s. 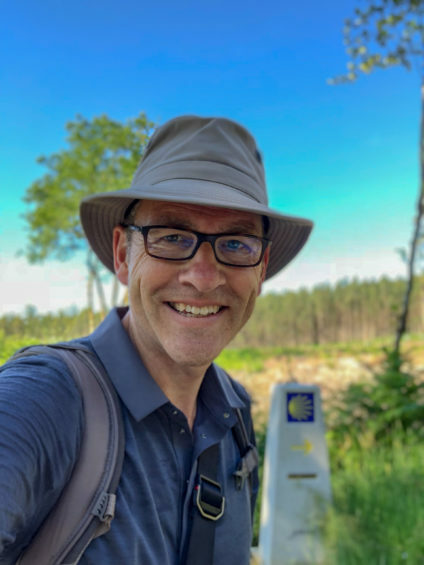 The picture above is a selfie taken this year during my most recent Camino in June.